President Rivlin meets with Central African Republic President Faustin-Archange Touadéra, says he's 'very pleased' with the visit. 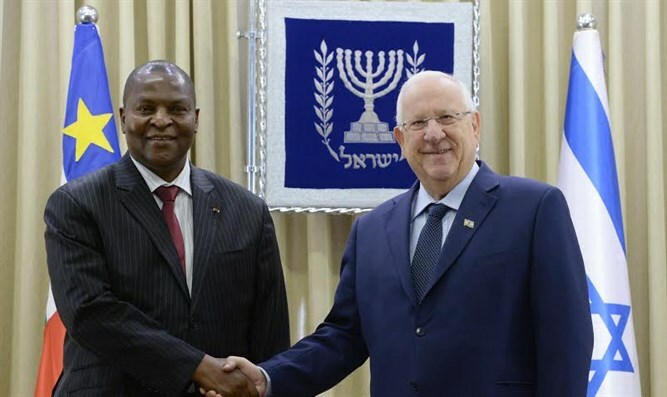 Israeli President Reuven Rivlin on Wednesday Central African Republic President Faustin-Archange Touadéra. At the meeting, which was held at Rivlin's residence, Rivlin said, "We have enjoyed ongoing connections out of a desire to expand the cooperation between our states, in humanitarian, economic, and cultural fields." "We are very pleased to welcome you on your visit, which is certainly a further step in the developing relations between us." Touadéra thanked Rivlin and told him of his great excitement to visit Jerusalem, and the Holy Land. "UNESCO wants to annul the connection between the Jewish People, to King David, Jerusalem the city of David, and Jews have lived in Jerusalem for 3,000 years," Rivlin said. "This is the first time a leader of the CAR has visited Israel, though we were one of the first states to recognize Israel," Touadéra began. "Our country has endured difficult times, and the people have proven that they want to get out of this situation, and so we have come to Israel in order to learn – your country is a school for us. "Israel has advanced abilities in development and this is a good example for us to be brave, and to have the will to succeed. We believe that cooperation can help both sides and we are committed to furthering this."